You are looking at a very interesting radio. The cabinet in a subtle trapezoid shape is a mixture of veneers. The radio features ribbed corners. The radio cabinet has been refinished and the work is nice. 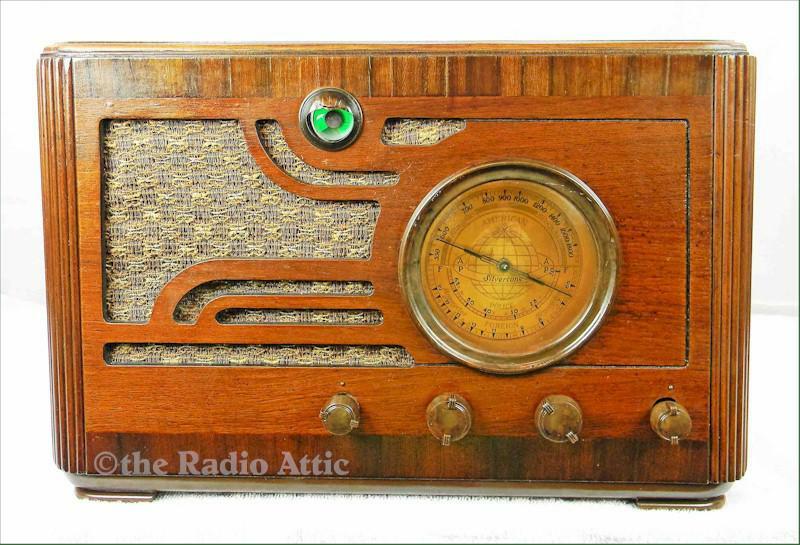 The radio retains the factory installed circular dial bezel and ornate knobs crafted of Tenite. This material has a tendency to shrink, yet this example they are all perfect. The speaker cloth is period correct and replacement. These radios are known as "gold dials" with the Silvertone globe and dual pilot light lit at night. Les has completed his highly professional repairs and the radio sings. The seven-tube super-het chassis is a sophisticated performer with a brand new green tuning eye which winks from station to station with great sensitivity. The radio was designed to be a three-band model; one is vacant today and the set offers both AM and Shortwave. Note the complete factory back. Les has added a mini-jack to the circuit and this additional connection will allow you to input any modern type of device. Your phone, pad, computer or any other will provide you unlimited content. Bluetooth is available for an additional $25. 17-1/2"W x 11-1/2"H x 10"D.
You are visitor number 2,842 to this page.